Praise, blame and all points in between? Your feedback published in the March 2015 magazine. 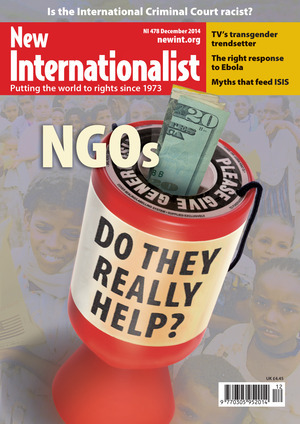 ‘NGOs do they help?’(NI 478) resonated with me. From 2010 to 2011, I worked in Swaziland with deaf students at the High School for the Deaf. I noticed that all of them struggled with written English [one of Swaziland’s two official languages], which massively restricted their life chances. Yet out of the 80 or so NGOs operating in that country, only two did any work with deaf people. That reinforced the gross inequality at the local level; not only were deaf people denied the information they needed (especially on avoiding HIV), they were also denied access to many services and, of course, funding available through the NGOs. But neoliberalism being what it is, deaf people are not included for the reason Sriskandarajah points out: ‘bang for your buck’. They are few in number but dispersed over a wide area and they need specialist (and expensive) communication workers. So from the NGOs’ point of view, not being able to report to funders the desired outcomes with the least outlay means that deaf people are a poor return on investment. I would imagine that is also true of other small minority groups that are difficult to reach and to engage with. I applaud the work of Dr Hamlin (Making Waves, NI 478) in her efforts to assist Ethiopian women with the devastating effects of fistulas in the female population. I think it is important to point out the underlying cause of fistulas: three-quarters of Ethiopian girls and women have been subjected to female genital mutilation. This is widespread and practised by both Christians and Muslims. 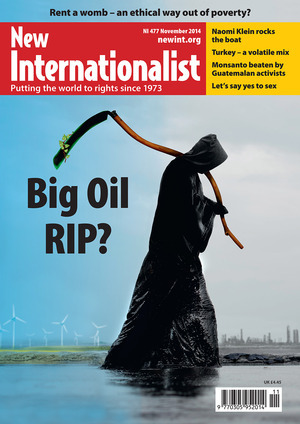 Big Oil RIP? (NI 477) was a masterpiece. In the UK our North Sea oil propped up the governments of Margaret Thatcher and Tony Blair and now that it has been frittered away, we have nothing to show for it. In the US, JH Kunstler, in his Long Emergency, blames the riches of oil for allowing a vast suburbia to be established that will be unworkable when the oil is gone within the next few decades. In Libya, where I helped to discover oil in the early 1960s, the nation is now imploding on itself... The list is endless; oil spells trouble wherever it is found and extracted – it does not lead to a sustainable life but often destroys the indigenous way of life which previously existed. I had just booked a trip to Cuba when NI 476 arrived, so I read it with more than the usual interest and took it with me when I went in December. I was going to give it to our local guide but everyone else in the group also wanted to read it first. My host in the family I stayed with also saw the cover and immediately asked to borrow the magazine. She returned it with compliments, saying most articles were, in her view, accurate. I now realize how very little reporting there is in our press about Cuba and when there is, how biased it is. Even if most people wanted more information about foreign affairs the daily press just don’t carry it. For that alone, I will continue to subscribe to your excellent magazine. Thank you for bringing to light the devastation wreaked by humanity’s lust for gold (NI 475). As someone who has taken part in Northern Canada’s mineral exploration camps, I know first-hand the absolute waste, recklessness and hypocrisy inherent to this industry. The most important message is that we can all help by taking a closer look at our investment portfolios. Often, mutual funds labelled ‘ethical’ contain shares in companies like Barrick Gold Corp and other Canadian-owned mining and oil giants that are only deemed ethical because they are not explicitly dealing in arms or cigarettes. We, the citizenry, have the power to affect great change by putting our consumer and investment dollars where our mouths are. It’s never too late: act now. The murder of Charlie Hebdo journalists and hostages, the shooting of the killers and the fear frenzy of an entire society – all this fills me with worry. Our Canadian Prime Minister Stephen Harper said that we are at war and had already committed jets for bombing runs over Syria and Iraq. I have heard that phrase again: ‘They hate us for our freedoms.’ The ‘Us-Them’ language tells me that we continue on that Orwellian road, in which our state is at perpetual war with an unseen enemy, thus giving the state rights above us ordinary citizens. I disagree with Charlie Hebdo’s cartoons not only because they served as an easy bait for Islamic fundamentalists but also because they permit the cyclical rebirth of state violence from Western governments, which can then pose as saviours of freedom of expression, women’s rights, etc. Does Berlusconi protect freedom of expression? Do Bush Sr or Jr’s policies guarantee fundamental freedoms in the Middle East? The blood of the victims in Paris serves the same purpose as those in the Twin Tower attacks: to roll out the Western war machine and corporate post-war reconstruction network, state terrorists par excellence. The world stage is taken up by radical fundamentalists of the religious and state kind, while issues of real importance (poverty, governance, human rights) are swept aside. I grieve for you, Charlie, but you have made us all tools of the state, once again. I first became aware of New Internationalist as a student. I was heavily involved with People and Planet, a student campaigning network, and would go to their national events, where there was often an NI stand. I then rediscovered NI a few years ago, when I was wandering through the magazine section at a train station – a very disheartening experience. Among all of the soul-sucking celebrity magazines, there was a copy of NI which I leapt on. I read almost all of it that day. I really enjoy the range of topics, and the in-depth sections are fabulous when I don’t know much about an issue. They are done in a way that doesn’t make me feel stupid for not knowing the history of a conflict or the background to a campaign. I am currently in treatment for anorexia and I was very disappointed when I found a large collection of gossip magazines in the waiting room of the eating-disorder clinic. I have since taken to leaving my back issues of NI in the waiting rooms I frequent, in the hope that they will be picked up by someone as an alternative to the magazines which make you feel bad about yourself. For me, focusing on wider issues is a helpful way to overcome the self-obsessive nature of anorexia; it makes me feel like I can make a small difference.